1. Identify, verify and overcome through artistic research and practice clichés and prejudices about a) the rich west and the poor Africa b) gender roles and the definition of childhood c) rural and urban live. 2. Bridge the gap between francophone and Anglophone Africa through joint projects with organizations in neighboring countries, Nigeria, Ghana and South Africa. Give Benin cultural players the opportunity to extend their research and networking beyond French based resources by offering an intensive English speaking and reading program. 3. Widen the perspectives of local artists on the range of their themes and methods by introducing them to a variety of socially engaged artists and their work through collaborations with visiting artists and lectures. 4. Discuss the local artistic production in the context of post colonial discourse. Challenge local artists to reflect on if they really need to produce works that fulfills westerners’ expectations on what African Art should look like. 5. Encourage critical writing on art leading to innovation and social engagement. 6. 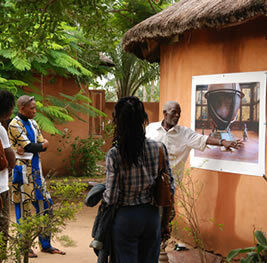 Create laboratories for innovative curatorial practice, as started during the Biennial Regard Benin 2012. 7. Host residences with artists from abroad to realize their collaborative projects and research in Benin. 8. 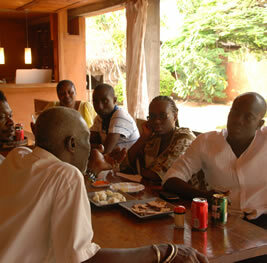 Encourage the networking and exchange of artists and curators from Benin with the rest of the world. 9. Introduce the work of Benin based artists to exhibitions abroad.